LOVING LETAVA HOME! (Home is located on Letava Road, off Bank Street). THIS ABSOLUTELY STUNNING 3-bedroom home has a separate self-contained cottage on a ¼ acre of landscaped lush garden of fruit trees and tropical ornamental plants. Bedrooms are large all with built-in wardrobes. Master bedroom with ensuite. House has a total of three bathrooms plus a separate toilet. It is ceramic-tiled throughout with a recently renovated open-planned kitchen. Fully secured - fence and gate, and security screens on all windows and doors. A large veranda faces the morning sun capturing cool sea-breeze and sea view. The lounge is open-plan with a cathedral ceiling. Solar hot water heater to the main house. The self-contained cottage can be used as a guest-room, rented out for an extra bit of cash, games room or as an office. It has a kitchen and a separate bathroom with gas water heater. A large car-port can fit up to 3 cars. In addition to very strong and reliable town-water system the home is serviced by an additional large water tank 3500l capacity with water pump. The home comes mostly furnished with a SKY-TV dish and decoder, and other whiteware goods (microwave, refrigerator, dryer, washing machine, and more). Excellent quiet neighbourhood with the best street-lighting in Apia. Mt Vaea and Robert Louis Stevenson's grave are not far from home, and there's a challenging footpath to the Vailima National Reserve and also to SPREP and to the Animal Protection Society. 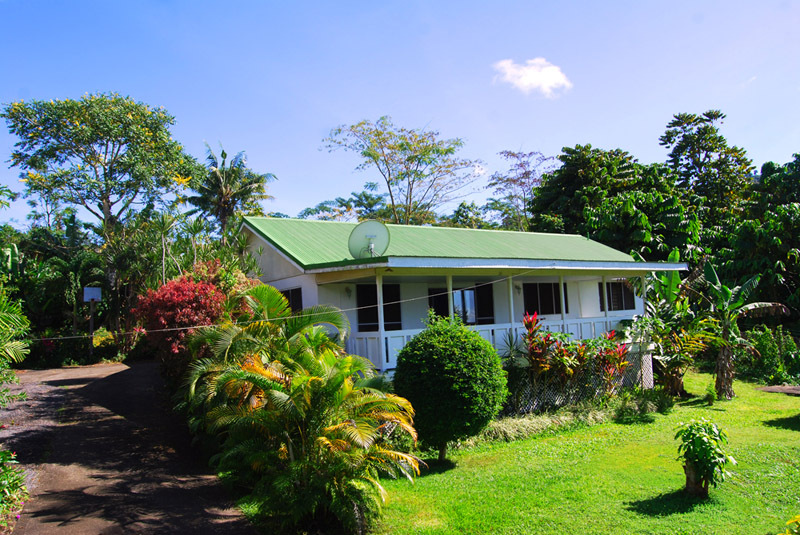 The home has excellent rental potential and only 10 minutes from Apia town. Interested in long term lease (6 months or more ONLY) - WST$3000 per month. Please contact me (click here) for further information. BEAUTIFUL & BREATHTAKING VIEW of Mt Vaea from a large open deck. This home comprises of three large bedrooms, all with air-condition and ceiling fans. It is located on a 1 and 1/2 acre land. Vaitele - 1/4 acre. Open fale with separate bathroom. Fully fenced and gated. Electricity and water. Taveuni, Fiji Island. 18 acres of elevated land - great view towards Somosomo Strait.